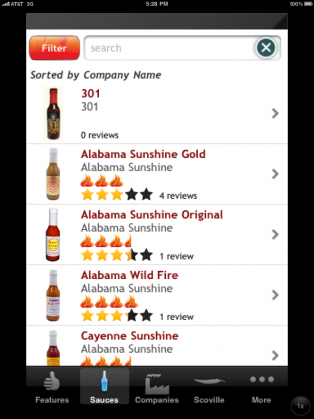 Jim Fraps and his partner Paul Yago have released Jim’s Burning Ring of Fire – the first App for iPhone/iPod/iPad where you can discover, track, rate and review all of your favorite hot sauces. 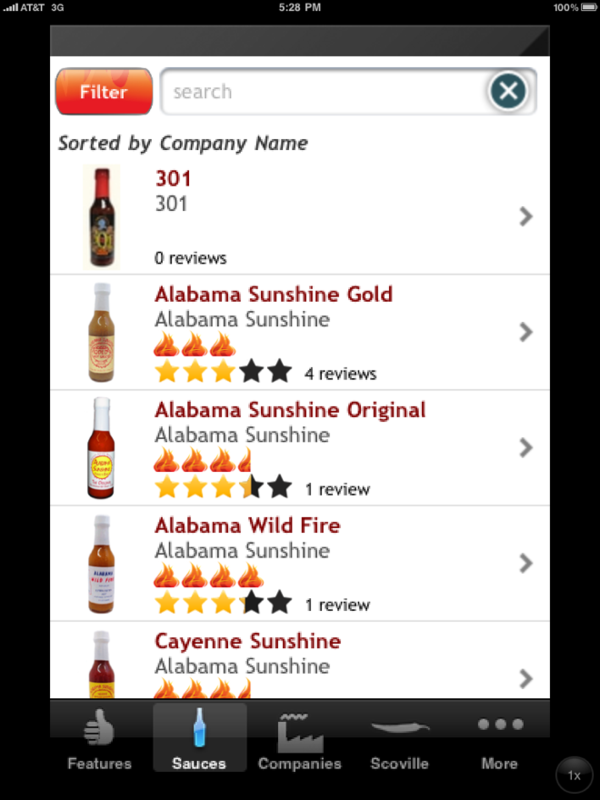 Now available in iTunes, this is the first app of its kind that I know of, and it’s beautifully done with easy navigation to sauces, companies, reviews and more. 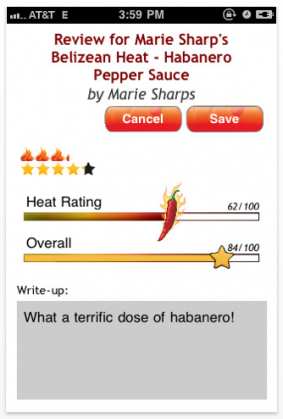 I’ve had the pleasure to beta test this app on my iPad and I can assure you I will be using this tool whenever I’m shopping for hot sauces. Also it’s fun to write a quick review with it – all reviews are sync-ed up with their server so your app is always up to date with all the reviews people contribute with it. Pretty cool stuff! See those cool sliders up there? That’s where you get to add your heat rating and overall score in addition to your comments about the sauce. Slick. We’ve included a Scoville reference scale with peppers and sauces rated from 0 to 16,000,000 Scoville heat units… The fire of love will be stoked as you trade burning memories with fellow arsonists and chili heads from around the world. Pretty romantic stuff there guys. 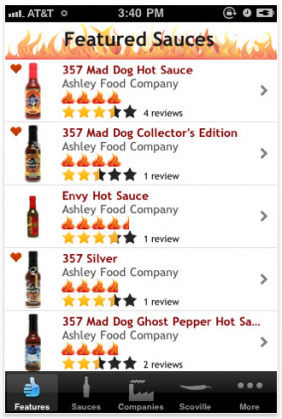 To celebrate the launch, they are offering an exclusive discount to Jim’s Burning Ring of Fire customers – a 20% off discount coupon for Ashley Foods, makers of the famous Mad Dog brand of hot sauces. Also, the first 20,000 to purchase the app will be entered into a contest for a 3 Day Trip for 2 to Baldface Lodge – a premier snowcat ski lodge (value approx. $5500). Go ahead. Go there now. It will make you happy! Here’s a screenshot of the app’s Company Search page on my iPad. Click for bigness. Good times!